I'm not convinced this book needs a review per-se. It's an itty-bitty book. I picked it up when I was at Powells picking up a book I had already purchased online (mmmmmmmmmm... used books, such a wonderful, wonderful thing). As I was wandering around the bookstore (I think I was in the literature section, looking for nicely bound Hemingways or Fitzgeralds), this one caught my eye. It was on a carousel, along with a number of other small books, clearly set up for an impulse purchase. So I impulsively looked. I figured at the time that I was purchasing it to signal to the publisher that I wanted books like this to exist. Tonight, however, I needed this book. Today was a f--king crappy day. The score is 5-0, with my score being the zero, and that's a good thing health-wise, but the 5 hurts and it hurts a lot. 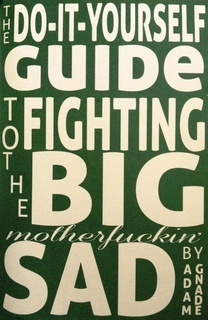 If you are in the grip of a depression, or even "just" a depressive episode, or really really sad, this book can help. It reminds you that you can get through this. It recommends ways to get through this. It tells you to keep going, because there's beauty on the other side. If you are not in the grip of depression, this book is a rah-rah-rah. It reads like a rah-rah-rah-you-can-do-it. And that's okay, this isn't the moment for you to read this book. See the previous paragraph to understand when could be the moment for you to read it. The book is short, less than a half hour read, even if you read slowly. It's worth reading, however, if you are in the moment of need.